The best time to visit the reserve is from February to June. The sanctuary can be reached by road. The nearest railway station is Udakamandalam. The nearest airport is Coimbatore. Accommodation can be arranged at forest rest house, guesthouses at Masinagudi, Kargudi, Abhayaranyam and Theppakkadu. 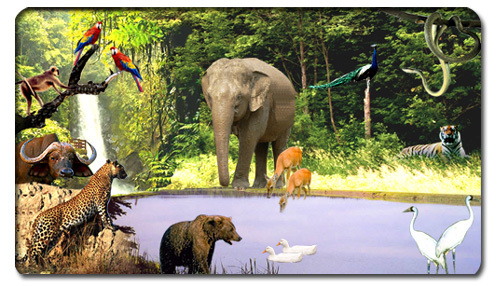 The fauna include Elephants, Gaur, Banner, Macaque, Common Langur, Tigers, Leopards, Chital, Panther, Sloth Bear, Python, Barking Deer, Four Horned Antelope, Otter, Crocodiles (Mugger), Giant Flying Squirrel, Sambar, Hyena, Wild Dog, Wild Boar, Mouse Deer, Spotted Deer, Jackal, Hare, Porcupine and Mongoose. The birds listed in this sanctuary are Peacock-our National bird, Grey Jungle Fowl, Red Spur Fowl, Grey Partridge Quails, Goggle Eyed Plower, Malabar Whistling Thrush, Large Racket-Tailed Dronge, The Magpie-robin, Spotted Babbler, Small Green Barbet, Green Pigeons, Brown Dove, Malabar Grey Hornbill, Bulbuls, Mynahs, etc. Among birds of prey, Eagles, Hawks, Buzzards, Harriers, Falcons and King Vulture are predominant, besides some migratory water birds. The drive from Bangalore to Mudumalai runs over wellmaintained State highways. The first stretch between Bangalore and Mysore is a reasonably smooth run. Once you cross the towns of Ramanagaram and Chennapatna, the drive gose through avenues of bougainvillaea which form natural archways. If you are thirsty, you can stop at any of the coconut vendors lininig the road. Passing through Mysore is a honk - and - crawl affair till the city limits. Beyond Nanjangud, for about 20 km, the road is a narrow concrete strip with shoulders of tar. You need to be very careful on this road as the tar has eroded, leaving huge potholes. There may be times when you will be forced to go onto the tar shoulders to avoid oncoming traffic. Remember, utmost care should be taken then to avoid damage to the underbody. Once the road enters the Bandipur Wildlife Sanctuary limit, it is almost straight with dense forest on both sides. Seven - and - a half kilometers after the Bandipur reception centre, the road crosses over into Tamil Nadu and the Mudumalai Wildlife Sanctuary. The scenery along the road is varied with a clutter of small towns on the outskrits of Bangalore. These give way to light forest and fields till Mysore. If you have time with you, a stop at the fantastic Mysore Palace is worth the extra hour to get to Mudumalai. The accomodation and hotels for Mudumalai are on the road that runs from the reception centre to Masinagudi. Though there is a sign warning that the road is very steep and that you have to strain your car much with the kind of cars that we have today, it is redundant. There is actually more to do at the places to stay than in the park itself. Consider yourself lucky if you see bison and deer. Should you happen to see a tiger, take a quick look around for the saint who performed the miracle to make it appear.